Are You Ready to Graduate From Renting to Owning a Home? With graduation season in full swing, many may be pondering a change in their living quarters. Some may be moving out of Mom and Dad’s house into dorms, or maybe out of dorms into their own apartments. But what if you’re ready to take an even bigger step—moving out of a rental into a home you can call your own? Buying a house, after all, is a great way to put down roots and build wealth (since homes tend to appreciate so you can sell later for a profit). But purchasing property isn’t a simple process, so you should make sure you’re prepared. So, how do you know if you’re ready to move from an apartment to a house? Ask yourself these questions below to get a sense of where you’re at—or what you have to do to transition easily into home-buying mode once the time is right. For starters, let’s talk money. Buying a home is a hefty purchase, probably the largest you’ll ever make. So, you’ll need a down payment (typically recommended to be 20% of the home’s purchase price) and steady income (i.e., a job) to pay your mortgage. While renting might seem more economical than owning at first glance, that’s not always the case; our rent vs. buy calculator can help you compare the costs. You might be surprised by the results! Another good first step to figuring out whether you can afford a house is to enter your salary and town of residence into a home affordability calculator, which will show you how much you’d pay for a mortgage on a typical house in that area. Or talk with a loan officer about whether you would qualify for a mortgage, and how much you can spend comfortably. Such consultations are free, and will give you a concrete dollars-and-cents sense of where you stand. Are you settled in your job? Your job situation is not only important in terms of income to buy a home, but also whether you’re happy where you work and plan to stay put. Because once you own a home, your career prospects do narrow somewhat, purely because a home anchors you to one area. Do you know where you want to live? 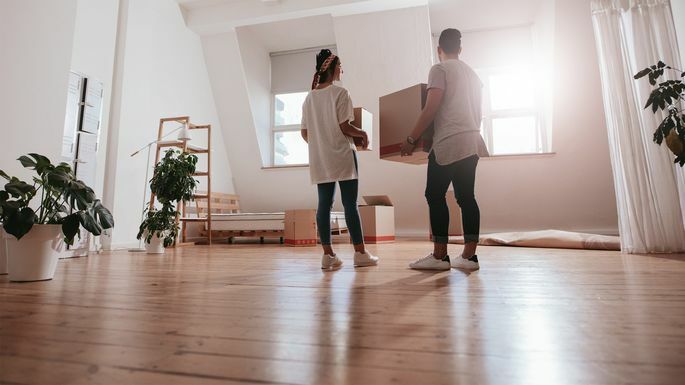 Since moving once you own a home is not as easy as just packing your bags (which, let’s face it, is a hassle in itself), you really need to make sure you’re picking a home in an area where you’ll be happy. When in doubt, try renting for a few months to make sure you like the area before you start shopping for a home to own for good. How much home maintenance are you willing to tackle? If you love the challenge of fixing a leaky faucet and figuring out which shrubs will flourish in your yard, homeownership may be right up your alley. But if the idea of mowing a lawn or messing with the HVAC makes you depressed, then you may want to stick with renting, which gives you a roof over your head without the work. Living in a house you own is a different story. There’s no landlord to call if anything goes wrong; it’s all up to you. So you have to be either adept as a handyman, or willing to find and pay someone else to do such tasks. Or else consider buying a condo or co-op, where the lawns and public areas around your home are maintained by hired help. Bottom line: Owning a home is a big commitment. So before you jump into it, you should have confidence that it works for your circumstances. Visit Houselogic.com for more article like this.